From L-R - Conor Reid, Conor McGregor, Faith Reid and Leanne Reid. Credit - @JohnJohnMc Twitter. UFC Lightweight champion Conor McGregor dropped by Crumlin's Children Hospital on Saturday to visit patients and their families, as he took some time out of his training schedule before his professional boxing debut against Floyd Mayweather Jr. in August. McGregor will take on Mayweather in Las Vegas in what is being billed as 'the biggest fight of all time', but before that, the Crumlin native went to one of the hospital's meeting rooms to spend time with some of the kids and their families. 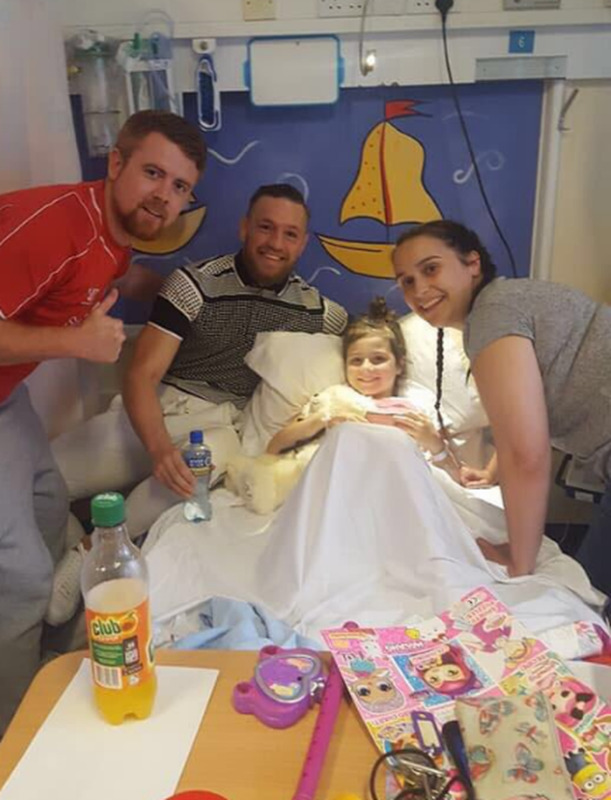 Hospital patients that were allowed to leave their beds were able to go and meet the UFC superstar and pose with him for pictures, while the kids that were unable to leave their wards were sent 'get well soon' videos by the two-weight world champion. However, Conor Reid, father of seven-year-old Faith Reid, who is in the children's hospital recovering from an emergency operation to get her appendix removed, asked McGregor if he would be willing to go and visit his daughter after she was unable to leave her bed following a dose of morphine. McGregor agreed to go see Faith, but after some initial resistance from hospital staff, who tried to redirect him to another room, the 28-year-old insisted that the matter was non-negotiable. "My wife asked one of the girls beside her 'what's going on?' And she said 'I think Conor McGregor is down in the meeting room talking to a few kids'. "A few people off the ward went down, but there were a few that couldn't go down, including Faith, who was hooked up to morphine after her operation. "They said there's no way on earth you can let her go out of the ward. It's not allowed. It's just against policy. "So I went down and got a 'get well soon' video off him, and then when he was on his way out of the room, there was also another three of four people that couldn't go meet him because they couldn't leave the ward. "I asked him if he could come over to the room to see Faith and he said he would, but one of the people that were high up in the hospital were saying 'you have to go here, you have to go here, you have to go here, you have to go here'... He was on a time schedule. "The woman told him 'no you can't go. You have to go to a different place'. "He said he wanted to go down and see Faith and she said 'no you can't'. "So he came in and gave her a big hug and a kiss. She was on about 25/mL's of morphine every hour, so she was a little bit weary, but when he gave her a huge she couldn't get over it really, she was speechless." Reid had met McGregor a year earlier when he had taken a photo with the Ballyfermot native following his marriage to his partner Leanne. Reid said McGregor remembered the occasion and wished them well. He added that McGregor had really lifted the spirits of patients and their families and that he had an ability to make everyone feel comfortable. Independent.ie Sportsdesk A UFC featherweight has claimed his blood was taken by someone he thought was a US Anti-Doping Agency employee - only to later discover they did not work for the organisation. Independent.ie Newsdesk John Kavanagh says he doesn't condone the mistakes Conor McGregor has made - but insists that the MMA fighter regrets them. Ian Begley Conor McGregor has pleaded not guilty in the US to charges of "strong-arm robbery and criminal mischief".